All the children did very well. They all arrive at school with their costumes on. I am a big jack-o-lantern, and my aide was Tigger--they get a kick out of this. After everyone has arrived we march in a parade for our moms, dads, grandmoms, grandpops, aunts, uncles, etc. They did a pretty good job this year. I only had one shy one. After the parade we put on a little "show." We were able to learn a total of five songs and fingerplays for the program. It's amazing, when practicing I think the neighbors could have heard us, but time for the show and we have trouble getting above a whisper. They really did well though--these are some of the best "singers" I have had in a few years. After the program we change into our regular clothes, family members go home and we finish out our day. This week we made those beautiful glitter spider webs from Raising Creative and Curious Kids. 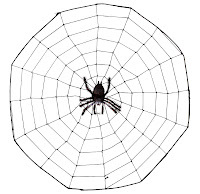 Pop on over to this site to see how to make these great webs. Thanks for the great idea--they were gorgeous--I love glitter. We also made the skeletons from the silly styrofoam skeleton post. I even tried out my husband's skeleton song with them--it's not like it's stuck in my head or anything. Wishing everyone a wonderful, safe, and spooky Halloween! Here are a couple of books that I found for the craft. 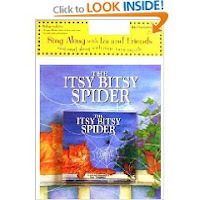 The first one and the one I read is "The Itsy Bitsy Spider," by Iza Trapini. This story basically begins as the fingerplay, but takes the spider on a few more adventures until he finds his home. The o ther book is "Itsy Bitsy Spider," by Keith Chapman, illustrated by Jack Tickle. In this story a spider is swooshed by the wind and takes a wild ride from one farm animal to another. When will his ride end, and who will be waiting? Both are very cute stories. Whats everyone doing for safety precautions for Halloween? My husband came across an article (http://i-newswire.com/pr220892.html) with some info about background checking neighbors. I thought that may be a little overboard, but it had some other good suggestions for some precautions I haven't thought about. Last year my youngest son came down with a massive fever after Halloween. I almost thought about just taking the kids to our church's fall festival this year instead of door-to-door to prevent that from happening again. I don't know yet. What's your advice? Am I over-reacting or just being a concerned mom? Hi Laura, it's great to be concerned, it helps you be aware of all your surroundings. I read the article, and it has some very helpful information in it, but it is also trying to sell something, so it probably is exaggerating the fear factor a bit. It is always good to practice safety during times like these. Without knowing your neighborhood, it is hard to say if you are overreacting or not, but the church festival is great. I've also seen where malls have trick-or-treating, local YMCA's, and I just saw in our local newspaper a festival was set at one of our local "retirement communities." I will say I would still be with my young children at these events. You have to do what you are completely comfortable with, but I really feel if you are with your children, do not allow them any candy until you check it, and use all safety practices you and the children can enjoy yourselves on Halloween eve. I am lucky enough to be in a great neighborhood where we know most of the neighbors. Of course, not all of them, but enough to be comfortable. The young children do not go out by themselves, and many of us travel the neighborhood together. As they get older though, it is hard to make them go with you. My 13 year old is going with her friends this year. A little scary, but I know they have to grow up. I know where she is going, who she is going with, what time to take her and what time to pick her up. There will be 6 or more of them going together. Good luck. Yeah- I'm so glad that your kiddos made the spider webs!! I saw them in a background photo on Parenting Pink's blog- her little girls made them. She told me that she wanted to do them, but it was great to see her final product!! So glad to share ideas! !